In 1976, a major expedition entered the Cueva de los Tayos in search of artificial tunnels, lost gold, strange sculptures, and a “metallic library,” supposedly left by a lost civilization aided by extraterrestrials. Among the group was the astronaut Neil Armstrong. For as long as anyone can remember, the indigenous Shuar people of Ecuador have been entering a vast cave system on the jungle-covered eastern foothills of the Andes. They descend, using ladders made of vines, through one of three vertiginous entrances, the largest of which is a 213-foot-deep (65-meter) shaft that leads into a network of tunnels and chambers stretching, as far as we know, for at least 2.85 miles. The largest chamber measures 295 feet by 787 feet. For the Shuar, these caves have long been a center for spiritual and ceremonial practices, home to powerful spirits as well as tarantulas, scorpions, spiders, and rainbow boas. 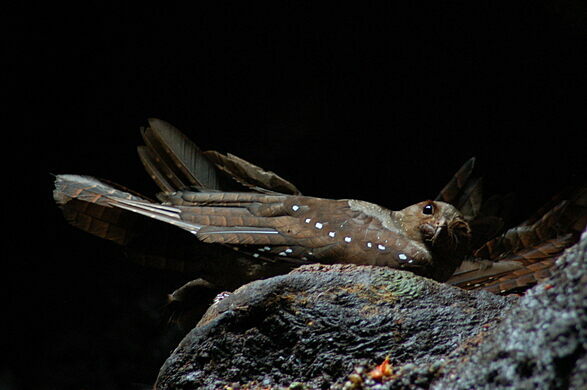 They are also home to nocturnal oilbirds, known locally as tayos, hence the name of the cave. The tayos are a favored food of the Shuar, another reason why they brave the depths of the cave system. In their role as guardians of the cave system, the Shuar had been left in relative peace over the last century or two, apart from an occasional gold prospector snooping around in the 1950s and ‘60s. Until, that was, a certain Erich von Däniken decided to get involved. The Swiss author captured the global imagination in 1968 with the publication of his book Chariots of the Gods?, which was in large part responsible for the current plague of ancient astronaut theories and all that malarkey. Then, three years later, he published The Gold of the Gods, unleashing a little-known theory about the Cueva de los Tayos upon his eager readership. In The Gold of the Gods, von Däniken recounted the claims of János Juan Móricz, an explorer who claimed to have entered the caves in 1969. Inside the cave, he asserted, he had discovered a treasure trove of gold, strange artifacts and sculptures, and a “metallic library” containing lost information preserved on metal tablets. And the caves themselves were surely artificial, he claimed, created by some advanced intelligence now lost to history. This was red meat for von Däniken, of course, and tied in very nicely with his spate of lucrative books promoting his theories of lost civilizations, ancient astronauts, and the like (or, as Carl Sagan put it, von Däniken’s theory that “our ancestors were dummies”). It also inspired the first major scientific expedition to Cueva de los Tayos. The 1976 expedition was led by Stan Hall, a Scottish civil engineer who had read von Däniken’s work. It quickly grew to become one of the largest cave expeditions of its time, with more than 100 people involved. These included British and Ecuadorian government officials, leading scientists and speleologists, British special forces, professional cavers, and none other than astronaut Neil Armstrong, who served as the expedition’s Honorary President. The expedition was a success, at least in its less fanciful ambitions. The extensive network of caves was mapped far more thoroughly than ever before. Zoological and botanical findings were recorded. And archaeological discoveries were made. But no gold was found, no otherworldly artifacts discovered, and there was no sign of a metallic library. The cave system, too, appeared to be the result of natural forces rather than any kind of advanced engineering. Interest in the Cueva de los Tayos never again reached the heights of the 1976 expedition, but numerous research expeditions have since taken place. One of the more recent expeditions was that of Josh Gates and his team for the fourth season of the television series Expedition Unknown. Gates entered the cave system with Shuar guides and Eileen Hall, the daughter of the late Stan Hall from the 1976 expedition. And while expeditions such as these have resulted in fascinating zoological and geological discoveries, there’s still no sign of gold, aliens, or a library. The Cueva de los Tayos is located in the rainforest about 23 miles southeast of the town of Santiago de Mendez in southeastern Ecuador, not far from the border with Peru. It is within the Sindical Center Coangos, and is therefore on Shuar territory. Access to the cave must be arranged with local Shuar authorities. Expeditions to the cave can be carried out on foot, by boat, or a combination of the two. It is sometimes also possible to go via helicopter from the town of Macas, some 50 miles north of the caves.